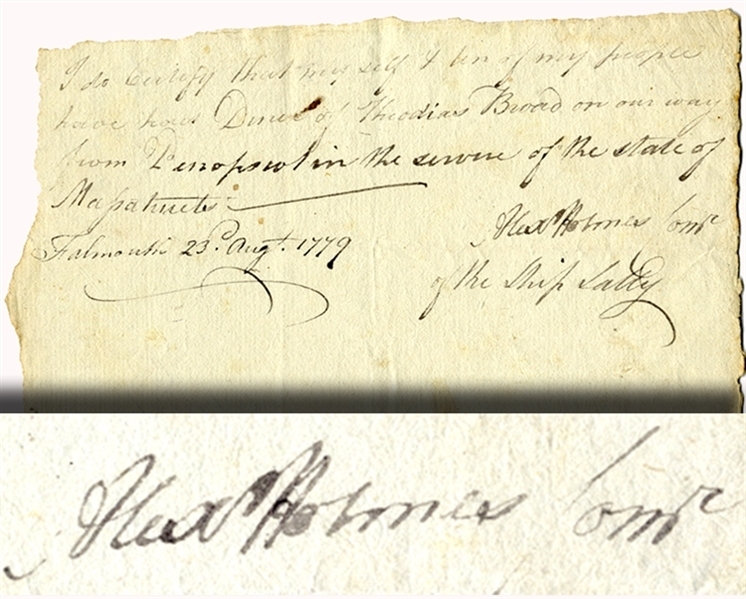 War-date Manuscript Document Signed “Alex Holmes” Commander of the Ship Sally, 1pp. oblong octavo, Falmouth, Massachusetts, August 23, 1779, and reads in part: “...I do certify that ...Theodias Broad on our way from Penobscot in the service of the state of Massachusetts...” Fine condition. The Penobscot Expedition was a 44-ship American naval task force mounted during the Revolutionary War by the Provincial Congress of the Province of Massachusetts Bay. The flotilla of 19 warships and 25 smaller support vessels sailed from Boston on July 19, 1779 for the upper Penobscot Bay in the District of Maine carrying a ground expeditionary force of more than 1,000 colonial Marines and militiamen. Also included was a 100-man artillery detachment under the command of Lt. Colonel Paul Revere. The Expedition's goal was to reclaim control of what is now mid-coast Maine from the British who had seized it a month earlier and renamed it New Ireland. It was the largest American naval expedition of the war. The fighting took place both on land and at sea in and around the mouth of the Penobscot and Bagaduce Rivers at what is today Castine, Maine over a period of three weeks in July and August of 1779. One of its greatest victories of the war for the British, the Expedition was also the United States' worst naval defeat until Pearl Harbor 162 years later in 1941.